What is Awery Aviation ERP? Awery Aviation ERP is an enterprise resource planning (ERP) system built specifically for the aviation industry. This very versatile and customizable ERP solution is created in collaboration with aviation experts to help aviation companies take absolute control over major business processes, including sales, operations, finance, and HR, resulting in significantly improved efficiency, productivity, and reliability. With Awery Aviation ERP, companies have an advanced, web-based ERP platform that enables them to integrate both internal and external management processes as well as operational and financial data flows. The system accelerates business processes without compromising accuracy while covering multiple facets of business management. The list includes Operations, Sales and Services, Revenue/Cost/Profitability, Customer Relations Management, Finance/Accounting, HR, Inventory, and more. The software makes it possible for users to implement a very transparent flow of information within the company, making it easy to see who’s accountable to what, who is working on which project, and the status of their inventory among others. Awery Aviation ERP is built specifically for the aviation industry, a fast-paced business sector, which is why the software boasts of a blazingly fast performance on top of a very user-friendly interface. Security is a paramount concern and to ensure that all information entered and processed within the Awery Aviation ERP platform is safe, the software uses Bank-grade security with advanced access policies. Companies with multiple branches and locations will love the fact that Awery Aviation ERP supports Multi-Company (Branches) configuration. Companies have the option to host Awery Aviation ERP on the cloud or install it on their own servers. Providing users with the ability to choose their preferred deployment allows them to fully maximize the software’s potential as they can implement it based on their preference and requirements. What Problems Will Awery Aviation ERP Solve? 1. Poor business processes and visibility – Awery ERP provides all the required tools, reminders, templates and reports in one place integrating business and financial operations across various departments, covering the entire workflow and supplying a multifunctional platform for day-to-day business activities. 2. Human intervention that results in multiple errors – Awery ERP provides automation and templates support. 3. A lot of time spent in vain – one of Awery key features is amazingly fast performance. Since each company has specific business wants, it is prudent for them to refrain from seeking a one-size-fits-all ideal software system. Needless to say, it would be pointless to try to find such a platform even among market-leading software applications. The smart thing to do would be to catalog the various important elements that require consideration such as key features, finances, skill levels of employees, company size etc. Then, you should do your research thoroughly. Read some Awery Aviation ERP reviews and look into each of the other systems in your shortlist in detail. Such in-depth homework can make sure you weed out ill-fitting systems and zero in on the solution that offers all the features you require for business success. How Much Does Awery Aviation ERP Cost? 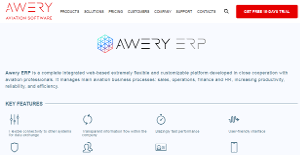 Contact Awery Aero ERP for enterprise pricing information and other product details. You can also submit a request for a free trial to see if the software is a perfect fit for your business. We realize that when you make a decision to buy ERP Software it’s important not only to see how experts evaluate it in their reviews, but also to find out if the real people and companies that buy it are actually satisfied with the product. That’s why we’ve created our behavior-based Customer Satisfaction Algorithm™ that gathers customer reviews, comments and Awery Aviation ERP reviews across a wide range of social media sites. The data is then presented in an easy to digest form showing how many people had positive and negative experience with Awery Aviation ERP. With that information at hand you should be equipped to make an informed buying decision that you won’t regret. What are Awery Aviation ERP pricing details? What integrations are available for Awery Aviation ERP? If you need more information about Awery Aviation ERP or you simply have a question let us know what you need and we’ll forward your request directly to the vendor.